Twenty seven new bindi body stickers are up on the site! My new favorites? 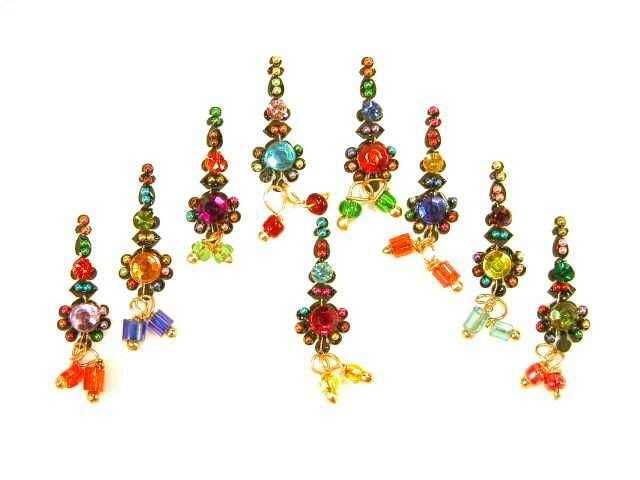 These fantastic bindi with beaded dangles. Too cute! Normally this style bindi is in more solid colors but I love that these have a black background. Remember, bindi aren't just for the forehead. They can be worn anywhere. These will be great as a delicate floating necklace. 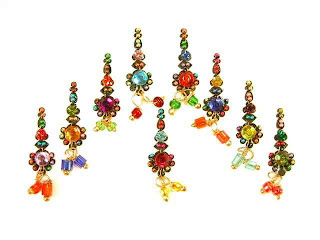 I think I may try 3 of them in a little triangle or one paired with a smaller plainer bindi on each side of it. Have you seen our bindi information site? Just an informational website all about bindi body stickers. How to apply bindi, traditional bindi applications and meanings, idea for interesting ways to wear bindi, and even a small gallery of bindi pictures! Feel free to send me pictures of you or your friends wearing bindi and I'll post them in the gallery or on Facebook.